Geostorm is a certifiable flop in every sense of the word. The long-in-development disaster movie finally arrived in theaters over the weekend. And it arrived with a thud. The movie made just $13.3 million domestically on its opening weekend, which doesn't even cover the very expensive reshoots, estimated to be $15 million, that the movie needed. At this point, Geostorm is almost certainly going to lose money. The question is, how much? It turns out, $100 million or more, making this one of the costliest missteps of the year. According to industry analysts, Geostorm needs to make around $360 million worldwide to break even. Geostorm, which carries a massive $120 million production budget, not to mention a very big marketing budget, has made just $65.4 million worldwide so far. The movie still needs to open in China, but even if the movie performs very well in that market, most of that money won't make its way back to the studio. So Warner Bros. and Skydance are bracing to take a massive loss on Geostorm, which had a very troubled production that no doubt contributed to the maligned mess that was released in theaters this weekend. Director Dean Devlin (Olympus Has Fallen) has been working on Geostorm for a very long time. According to reports, the movie took three years from the greenlight to release, which is much longer than usual for this type of movie Sadly, things didn't go well and at one point, Jerry Bruckheimer's production team was brought in to try and save Geostorm, with the first cut being deemed "unwatchable." "Sources tell Deadline that the first cut shown to Warner Bros. studio executives was "unwatchable." Geostorm spent 61 weeks in post, went through two composers, and was previewed three-to-four times before Silverman and Ellison phoned up Bruckheimer for help. Before Bruckheimer's team stepped in to clear up Geostorm, they reportedly wanted to make sure that Devlin was OK with their participation, given their respect for him. Devlin was scheduled to continue on to his next directorial, the thriller Bad Samaritan. Devlin welcomed Bruckheimer's help, and was privy to all the changes being made, including Danny Cannon's direction and Laeta Kalogridis' rewrites." There were other factors that led to Geostorm completely bottoming out at the box office. Box-office analyst Jeff Bock of Exhibitor Relations had this to say to The Hollywood Reporter. "The fact that Geostorm looked like a mashup of every single disaster movie ever created is probably the culprit here. And it certainly didn't help that our country recently faced a double whammy of storms that tore through Texas, Puerto Rico and Florida." In the months leading up to the movie's release in theaters, several parts of the world were struck by massive storms, with the United States suffering two back-to-back hurricanes that proved to be very devastating. The marketing campaign had to be quickly scrubbed, changing the tagline "Brave the Storm" from posters while new TV spots were created. This did not help the swelling budget one bit. The studio sent out the following note to theaters about the change. "We want to be sensitive to everyone who are being and have been impacted by the horrible storms, including families that may live in unaffected areas. That said, please pull the Geostorm one-sheet currently in theaters. We will ship new one-sheets once the campaign has been modified." The new posters contained the refreshed tagline "Control the Weather, Control the World." But that hasn't helped anything except some unwanted controversy. Jeff Goldstein, president of domestic distribution for Warners, had this to say about the movie's low numbers in areas where the hurricanes hit the hardest, such as in the Southeast, the South and Texas. "As evidenced by the extremely soft results in places hit by the hurricanes, the timing of the movie's release was unfortunate. Outside the U.S., the numbers are much better." Unfortunately for Geostorm, only a small number of disaster movies in the last five years have made the kind of money this movie needs to make in order to break even. San Andreas ($473 million), Godzilla ($530 million), World War Z ($540 million) and Gravity ($723 million) are the only ones to do so, and that's using the term disaster somewhat loosely. Other disaster movies like Independence Day: Resurgence proved to be massive bombs, but Geostorm was already far too deep into production to pull the plug. 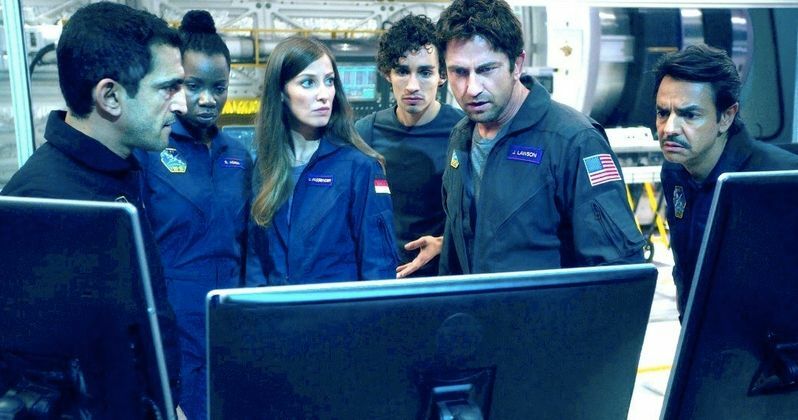 As the weeks roll on, things aren't going to get easier for Geostorm. Jigsaw is set to arrive in theaters this weekend and should do very well, considering that it lines up perfectly with the weekend before Halloween. It in no way helps that Geostorm has a dreadful 11 percent approval rating on Rotten Tomatoes right now. All of that considered, it's no wonder that Deadline is predicting the movie is going to lose so much money.